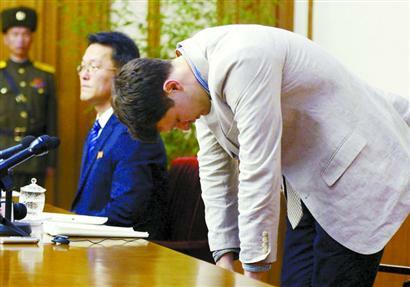 Otto Warmbier appeared at a North Korean press conference and made a public statement apologizing and asking for forgiveness. The 21-year-old University of Virginia student was arrested last month before boarding a plane out of the country. He has been charged with committing a hostile act against the state, with the help of the United States. Warmbier said he removed a sign from a hotel in an area only for workers. He and his tour group stayed at the hotel. He said a member of his church asked him to bring the sign to the United States to show to others. Warmbier was reportedly in North Korea on a discount tour for college students, not a church group. North Korea has not said what punishment Warmbier may face. "I understand the severity of my crime, and I have no idea what sort of penalty I may face, but I am begging to the Korean people and government for my forgiveness," Warmbier said. "And I am praying to the heavens so that I may be returned home to my family." North Korea has often detained Americans and other foreign citizens on false charges. The detainees are usually forced to read statements to foreign journalists confessing to crimes against the state. Most experts say the detainees are forced to make the statements. When the detainees are released, they often say they did not make the statements voluntarily and that they do not agree with what they were forced to say. Experts say North Korea often tries to use the detainees in negotiations with the West. Companies that work with travelers bring people to North Korea so they can see how people live in the closed country. But the U.S. and Canadian governments say people should not travel to North Korea. She was detained in the office by unexpected callers. After the interview they held a press conference together. He ask for leave of absence to visit his mother in hospital. He was spotted by police boarding a plane for Paris. 1.He has been charged with committing a hostile act against the state, with the help of the United States. He was charged with being an accessory to the crime. 2.Warmbier said he removed a sign from a hotel in an area only for workers. Its use is only for precise work, as in making microelectronic circuits. Electric currents persisted only for a moment. interviewn. 接见，会见，面试，面谈 vt. 接见，采访，对 .